Kids want and enjoy toys that reflect their own experiences--and for more and more kids today, their experiences include disability, whether first-hand or in their family, friends, neighborhoods, and classrooms. Bint Alshamsa recently blogged about the dearth of appropriate toys, riffing from the "Trache-ing Elmo" post at Kintropy in Action. During all the negotiations, the children kept gravitating to what we call the Elevator House (but which is officially called Rosaceae Sustainus) to play. So, we had an inkling of which one should win the Kids' Choice Award. The children particularly loved the hand-cranked elevator in the middle of the house. This house was open, making the spaces easily accessible, and it also included a grey water system with shell sinks. If you shop for holiday gifts for children this season, notice what's available to promote a sense of inclusion; and what reflects the everyday diversity kids know and accept already. Why shouldn't we try to find toys that support and encourage that? Found this on the blog of artist Aileen Roberts, it's what she did for her sister's cast: We should all have such cool sisters! (Go see it at Aileen's blog to catch the other side of the design.) Reminds me of the bling kit Sara's true love gave her, to decorate her leg. Or my own son's Christmas stockings. Kinda gives holiday decorating a whole new dimension, eh? Kara Sheridan starts us into the second year of the Disability Blog Carnival with a fine edition built around the simple prompt "If..." IF you go have a peek, you'll find plenty of wistfulness and wondering, counterfactuals and contingencies, dreams and visions... and an autumnal handcycle tour that's not at all imaginary, and gorgeous to join, if only in a virtual sense. Go, find poetry, art, video, dogs, young folks, old folks, and a lot of terrific writing too. Next edition will be hosted by Greg at Pitt Rehab, who asks, "How do you relax, unwind?" The deadline for submissions is November 5, so start relaxing now; it's important to fully research your subject before writing, isn't it? Watch for the Carnival to post on November 8, unless the Boston Red Sox win the World Series the week before--in which case Greg might need a few extra days to accommodate his celebrations. You can submit links for consideration by leaving a comment here, or with Greg, or using the blogcarnival.com form. 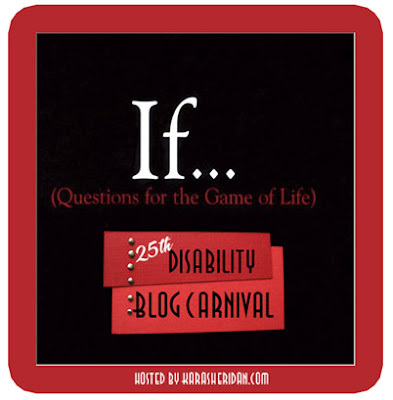 As always, huge thanks to the hosts and other participants for making this carnival a vibrant and active part of the disability blogging community. We're seeing ashfall. It's not Pompeii after the eruption of Vesuvius, but cars parked outside get a fine dusting. And if you look closely, there are ash particles floating around in the air everywhere. That means there must also be smaller-than-visible particles in every breath. Our Air Quality Index on the coast today is at U--U for "unhealthy." (There are actually two worse designations: V, for "very unhealthy," and H, for "hazardous.") Schools are advised to cancel outdoor physical activities. People are rubbing their eyes on every corner. Throats burn, and we're all coughing a lot. I'm keeping my little-used inhaler handy. For most folks, it's a minor, temporary problem, and they're grateful that's all we're getting here. But for people with existing heart, lung, or other health conditions; for people whose jobs have them working outdoors all day; and for older people and little kids, this can be a serious, even life-threatening matter. So when you see the satellite images of the smoke plumes, or hear about how many square miles are burned, remember that a much wider area is affected by these events in less dramatic ways (no good television footage to gain from asthmatic gasping, or kids sitting indoors instead of having recess). And disabled people are often feeling it more than most. 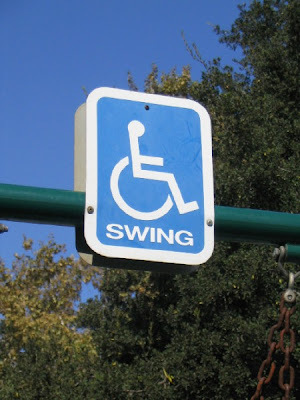 Visual description: A blue accessibility placard with the word "SWING" under the usual symbol; attached to a horizontal bar, to which a heavy-duty playground chain is attached; against a background of trees and blue sky. For Wordless Wednesday. Taken at the Shane's Inspiration playground in Griffith Park, in Los Angeles, on Sunday. So says Kara Sheridan at If the World Had Wheels, host of the next edition of the Carnival. She even made us a nice red-and-black graphic (at right) for the event! She tells me, "I’m more interested in motivating more people to participate than sticking too closely to the chosen theme," so don't be shy, submit your own posts or other bloggers' posts for consideration at the blogcarnival.com form, or leave a comment here, or with Kara, by the evening of Monday the 22nd. My boss Diane Nelson Bryen, Executive Director of the Institute on Disabilities at Temple University, has just been notified that she will be receiving the Distinguished Achievement Award from the Association of University Centers on Disabilities [AUCD], in recognition of her lifetime of accomplishments for and with the disability community, in the Commonwealth of Pennsylvania certainly, but also nationally and internationally. The awards cermony was held during the AUCD annual meeting, Wednesday, November 14, 2007 from 8:45 to 10:00 am at the Renaissance Washington Hotel, Washington, DC. I have a deaf schizophrenic brother that people were mean to when I was young. I couldn't understand why people would be mean to him because he was deaf. That translated into wanting to stop bullies being mean to...people, just because they are weak. I'll tell you why I care. My brother was born deaf, he cannot hear a sound. My brother cannot speak. In adolescence he developed severe violent schizophrenia. He is 54 years old. My family has lived with severe disability my entire life. I have no doubt about the impact of disability on a family and a community. I live in the United States of America where there is some possibility to help the disabled. But let me tell you there's still a lot of gaps here, too. And when I think about that reality, and I think about the people here from the poorest countries in the world trying to live with disability, trying to provide for their families when they can barely manage on a daily basis, I care very deeply and very profoundly. I feel it in my bones because of my own experience. Williams turns 57 today. "When we began, we were just three people sitting in a room. It was utopia. None of us thought we would ever ban land mines. I never thought it would happen in just six years," she told the Boston Globe. We may call on the surgeon for any act upon an individual which is to benefit him. We may not treat him as we do with our cattle, for the benefit of ourselves or the state. --Alexander Johnson, "Report of the Committee on Colonies for and Segregation of Defectives," Proceedings of the National Conference on Charities and Correction, 1903. Happened upon this quote in an article I've assigned for my online course in US disability history this week. We're reading about the history of eugenic sterilization laws, policies, and practices this week. The idea that all disabled people, all convicted criminals, all poor folks should be sterilized once made sense to a frightening lot of Americans. It's heartening to know that, even at the height of the eugenics movement, some folks realized it was wrong, and said so, like in the quote above. Johnson and his committee were all heads of state schools for "feebleminded" children, and they all objected to the idea that sterilization should be added to their duties. In the end, their position was vindicated, but not before many thousands of routine sterilizations were performed in the next several decades, often without consent or even truthful explanations. I wish this quote wasn't quite so timely. I wish folks didn't talk about major surgery as a casual thing (even when it's medically necessary, it's a big deal, with plenty of pain and risk, no matter what it looks like on TV). I wish the child's rights and interests were taken seriously. I wish folks weren't so squeamish about ordinary bodily functions. I wish people wouldn't use the "unless you're a parent like me you can't understand" line of defense, because that presumes parents like me understand, and I don't. I wish we knew better. Oh wait, we do. NOTE: After the last round on this topic, when we had lovely comments comparing people like my son to doorstops and turnips (thanks so much, CNN, for sending the anonymous hate this way), I'm just not going to respond to anonymous or ugly comments. In truth, I might not respond to any comments. I've got a carnival edition to assemble. Panorama taken at our DS Meetup, originally uploaded by Edu-Tourist. We had a great turnout for our monthly Disability Studies Meetup at Temple University's TECH Center. It definitely had a literary and artistic flair. Carol asked each attendee to write down the name that they would like to give to their autobiography. I think we have the notes somewhere, but my favorite title was "I Learned Everything from Carol." The more formal program consisted of a presentation by Sarah Drury on some of the basic computer circuitry that underlay eVokability, a project to expand the emotional expressive range of people with disabilities through new media. Photos from the public performance of the eVokability: The Walking Project can be seen elsewhere on this blog. Shoutout to Lydia for the bringing the veggies! We are open to suggestions on artists and performers to bring in next month, in conjuction with the Philadelphia's own Independence Starts Here Festival of Disability Arts and Culture. The conference Journeys into Madness: Representing Mental Illness in the Arts and Sciences, 1850-1930 will take place at the Wellcome Collection Conference Centre, London, on 11 and 12 October 2007. This conference has been supported by the University of Plymouth, the Wellcome Trust and the British Academy. To book your place, please contact Gemma Blackshaw. Payment can be sent electronically or by post. I just wanted to give a shout out to the academic community about the call for papers for the 2008 Canadian Disability Studies Association/Association Canadienne des Études sur l'Incapacité Conference. Note that the deadline for submissions is November 22, 2007. From my past service as Communications Officer (English), plus attending the CDSA-ACEI conference last year, I know both undergraduate and graduate students are especially encouraged to submit proposals. Please be advised there is no funding available from CDSA-ACEI for anyone attending the conference. Check with your university regarding funding for conferences, especially if you are accepted as a presenter at the CDSA-ACEI conference. Individual requests for disability services and accommodations during the CDSA-ACEI conference such as ASL interpreting, CART/Real-time voice-to-text interpreting, alternate formats for printed and visual materials, etc., must be booked well in advance with the Conference Coordinator.